Iverk Produce Carrick Wheelers’ Hugh Mulhearne 2013 campaign ended last September, but the rewards of all his hard work have still been rolling in. The latest award for the Waterford man to receive is the Annerville Award for Cycling. 2013 has been somewhat of a stellar year for the Waterford man, a year that has seen him notch up result after result, amounting to five National Championship medals on both the road and track. Mulhearne won the National Veteran’s title on the roads of Carlingford last June. After that huge success, about which his season was framed, his eyes switched to track racing. Mulhearne wasted no time settling in to track mode and in the latter part of his season he picked up three more medals. By the time he finished up for the season, he had enough gold around his neck to worry Mr. T.
Hugh was accompanied on the night by his wife Breda and his sisters. He describes the event as very well run and professional, and deems it great to get the award. 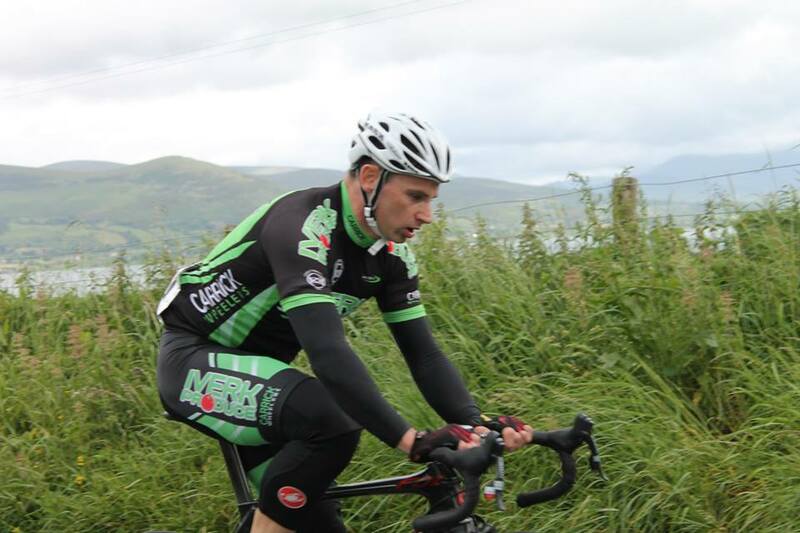 Undoubtedly the highlight of Hugh Mulhearne’s year was the National Veteran’s Road Race Championship that he won in a display of fine style in Carlingford, Co. Louth earlier this year. After a shaky start to the year due to work commitments and injuries, Mulhearne put the head down and with the support of his family, his coach, his club and his local roads, reaped the rewards in June later that year. Mulhearne is well known by his peers as a truly humble gentleman of the sport, and is not the first (nor will he be the last) Carrick cyclist to win the Annerville Award. Previous riders from the same club include the great Bobby Power (RIP), Stephen Spratt, former Olympian Robert Power, current professional rider Sam Bennett and the up and coming Michael O’Loughlin. Hugh truly deserves his award and from all at the club we congratulate him on his successes and wish him the very best for 2014.